Ged aka @iamgedster on Twitter asked how I cope with hay fever. Some people suffer worse than others and at different times of the year depending on the type of pollen floating around. I have a grass pollen allergy which affects mainly my nose and eyes. Also I can not sit on cut grass as it brings me out in a rash. I suffer differently depending on what county and country I am in. The worst hay fever I ever suffered was in Boston, USA but I never suffered in Australia. During childhood I used eye drops and nasal spray. As a teenager my hay fever worsened so the Doctor prescribed Clarityn (antihistamines). 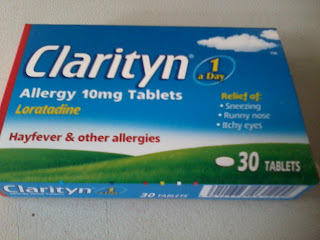 These days Clarityn is available without prescription so I buy them at the Pharmacy. Over the years I have tried other brands of antihistamines, even though the ingredients can be identical Clarityn always works the best, it’s one of those unexplained mysteries. A couple of years ago I picked up some advice from a TV show which changed the way I used my antihistamines. The tip given by a Doctor on the show I was viewing was you need to start taking antihistamines before your hay fever kicks in. By doing this you allow the medication to build up in your body and you will be better protected. I have followed this advice and seen a big reduction in my symptoms. Aside from medications there are other ways to help you managed symptoms. As boring as it sounds staying indoors is a solution and I shut windows when the neighbours have the lawn mowers out. I also shower and change clothes more often to rid my body and hair of pollen especially if I have spent the whole day outside. Hanging washing out on the line to dry is lovely but you will bring pollen into your home on your clean laundry. Some people believe that eating honey can desensitise them to pollen over time especially if you eat locally produced honey. However, I have read articles that say there is no proof to this theory and it is a myth. I am aware of the brand HayMax a natural treatment for hay fever. I have never tried for myself but I have seen positive feedback. You should be able to pick it up at your local Holland & Barrett alternatively there is an online shop. Whilst writing this post I saw a tweet from Weleda. 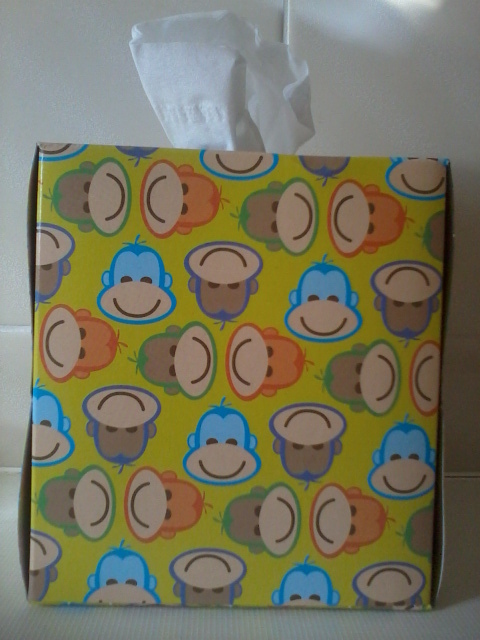 They have natural hay fever kit. I have seen at Boots New Era Hayfever Allergic Rhinitis a homeopathically prepared biochemic remedy. You could also try Aromatherapy. Eucalyptus and peppermint are useful if your nose is blocked and lavender is calming if your sleep is affected by symptoms. If you have any advice for coping with hay fever or a natural remedy to recommend, please leave a comment below. Disclaimer - all content provided on this blog is for informational purposes only. Please ensure you patch test products before use and seek professional medical advice. I feel very lucky that I have never suffered with hayfever as it can be so debilitating if it creeps up on you, I'm sure. I did have a friend at school who suffered terribly and she used to put vaseline all around her nostrils saying that it stopped the pollen getting up her nose and she used to swear by it! Thanks for the links I sure they will be helpful, I think it is all trial and error, my solution has been taking the antihistamines prior to hayfever season. I tried the hay fever balms and found that it didnt really help that much! I wasnt taking hay fever pills at the time but trying supplements so I dont know if that makes a difference. 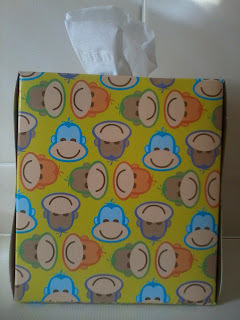 I put it on but once the sneezing and blowing the nose started it was rubbed off straight away! 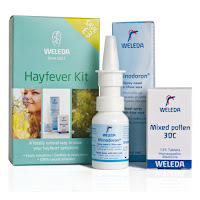 I have just bought the Weleda spray as I have now invested in hayfever tablets from boots so I will let you know how i get on with it!